Description: it has a better faster camera and a built-in operating system. It’s available in gold, silver and grey with sleekless of metal and glass, saphire crystal in home button and protecting iSight camera. It’s fast on download and uploads with 13 LTE bands. Screen is designed with iOS7 where it has new features like 64-bit chip that gives your graphics up to 2X faster than the A6 for example on games the shadows and texture looks more true to life, touch id finger identity processor where you put your finger on the home button and then it opens. It’s a convenient way to secure your phone. iSight camera that takes amazing photos, large sensor, larger pixels, continuous burst mode, true tone flash, auto image stabilisation, slow motion video and large video zoom, square photos to use on your special networks, panorama and photo filters, air drop and face time high definition camera for your video calling. That makes things you do everyday much easier, faster HD enjoyable. App store comes with loads of amazing collection of free apps. Over 900 000 of apps available for download from education and education, social networking and so much more. The iCloud is for photo sharing with friends who have also have iCloud app where they get to comment on the picture. It comes with 3 storage sizes 16 GB, 32 GB and 64 GB. This phone comes with 1 year of hard repair warranty and 90 days of complimentary support. Price: for the 16GB is R7000 and the 64GB space is R16000. This phone is water and dust proof with 2580 X 1440 pixel display, 16 megapixel camera, 3GB of RAM, 32GB or 64 GB of storage, 3,200mAH battery and kit-kat Andriod, eryngoes chip. The release date of this phone was on the 24 February 2014. The iPhone still has the same screen, the same as the previous ones whereas Samsung comes with a bigger screen as compared to the previous galaxy phones. 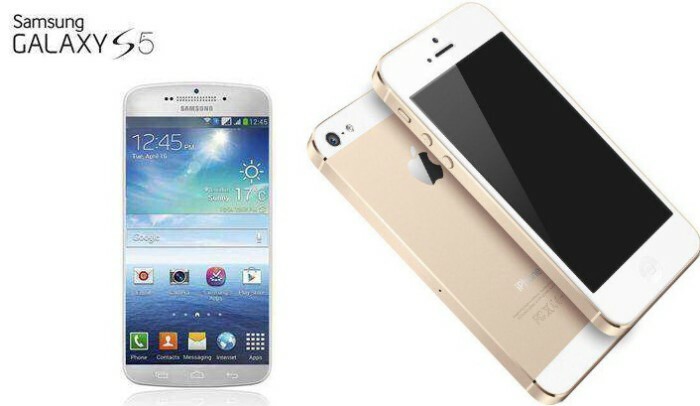 When it comes to safety Samsung is now dust and waterproof and iPhone has a finger identity processor.